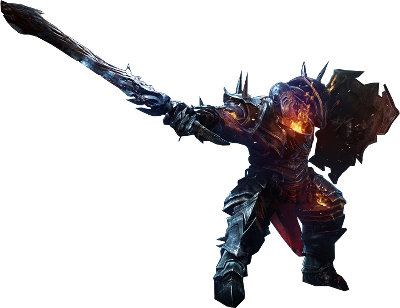 Rhogar Bulwark is an Enemy in Lords of the Fallen. Enemies are hostile creatures and humans that Harkyn encounters throughout the game. They have different resistances and drops, sometimes leaving behind powerful Weapons. Heavily armored and carrying a large shield the Bulwark can be a fearsome enemy when first encountered, as most attacks thrown its way will be easily blocked. "If you find Rhogar Bulwark from Lords of the Fallen tough, here is a couple of basic melee strats. First, he's relatively easy to riposte (you don't have to be a Rogue class to be able to try riposting, as the Buckler shield doesn't really have any attribute requirement). Second, it's possible to stun him by timing your attacks well. Notice I'm using a leaping attacks, as they're the ones with relatively high Attack Power (but heavy attacks will work too). Third, you can try more advanced timing by following up the stun with some attacks, but you need to find a time window before he retaliates. I used staff here, as this weapon can hit in rapid succession. General - The ability to riposte them, is normally the recommended route when it comes to fighting the Bulwark head on. However, you can also use clones to distract them to get a few hits in. Casters - Generally using the simple ranged attack for the gauntlet works well on the Bulwark, as they cannot block magic. However, due to their health pool, you will need to repeat the process of landing these attacks quite a few times. I was using a default controller layout, played with an X360 controller plugged into my PC. This video does NOT cover using Spells, Gauntlet, and extra debuffs like Poison rune that lets you add DoT to your attacks. So, all in all, there's plenty ways to take this guy on."